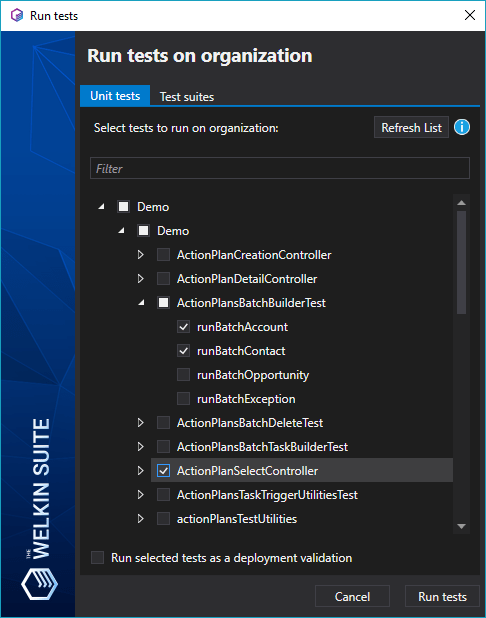 The Run Tests window helps you to select particular test classes or even methods from different test classes and execute only them. Open this window from the Test Result panel, using the context menu of a test method, the Main Menu, or the hotkeys Ctrl+R, Ctrl+С. 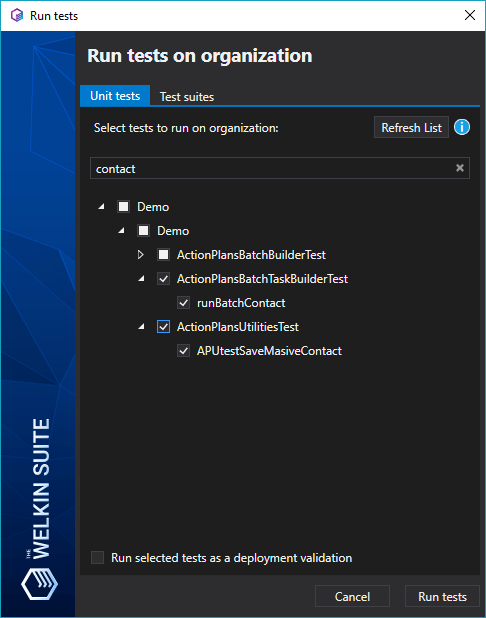 The Welkin Suite will refresh the list of available tests from Salesforce. If you have a cached test list, this process will take just a few seconds. To run separate tests, navigate to the Unit tests tab. If you are working with the solution that includes several projects, the list of your projects becomes available once you open the Test Run wizard. The list of all available tests is downloaded from the Salesforce org only when the Run Tests window opens for the first time, and then it is cached. The list of the test classes that was loaded previously will be displayed immediately in the Run Tests window, so you won't have to wait for the tests to be downloaded again. Each of the items on this list can be expanded. If you choose to expand, you will see the list of the separate test methods that this test class includes. By default, if you select any test class, all test methods that it includes will be checked, but you can deselect those test methods that you don't want to run at the moment. This window also features Select all and Select none buttons, so you can easily check all available tests or cancel the selection. The Filter input above the list helps you quickly find the necessary tests. It is not case-sensitive. Type the text that the name of a test method / class includes, and you will get a list of test classes with such test methods. In this list, you can see the classes that do not have your search expression in their names. This means that these test classes include methods with such matches. Expand the class, and you will see the methods that you are looking for. You can easily get the newest list of test classes by clicking on the Refresh List button in the top-right corner. This action sends a query to Salesforce and at the same time checks the local files for the available test (the search criteria is @istest). If you create a new test class or method, in order to find them in the list, you need to build them first. Hover the cursor on the Info icon near the Refresh List button to see information about the current list of tests. This cache is stored even between your sessions, so even after rebooting The Welkin Suite IDE or user PC, when you re-launch the IDE, it will automatically display the list of test classes from the cache for your current project. The checkbox Run selected tests as a deployment validation allows you to execute tests with the highest priority on a 'fake' deployment. This feature is very helpful when you need only to verify some tests. When all the necessary tests are selected, click on the Run tests button. If you want to go back, click on the Cancel button. You can see the progress of the test-run in the Test Results panel.